Medellín, Colombia’s Metrocable aerial cable car system helps connect residents of the city’s informal settlements to jobs and opportunities in the urban core. Photo by Mariana Gil/ EMBARQ Brasil. Latin America’s rate of urbanization peaked in the 1960s and 1970s, during which the region’s cities saw unprecedented rural to urban migration. In the following decades, violence in many of these population-drained rural areas accelerated the flow of rural migrants into cities. Because few cities were able to provide adequate low-income housing, the majority of these new urbanites settled in slums and other informal developments. Most of these slums are located on the outskirts of major cities, and many are in flood plains or nestled in hilly terrain. As unplanned settlements, these communities typically lack quality public spaces and basic transport infrastructure. Streets in these areas tend to be insufficient in terms of quantity and quality, often unpaved with steep slopes and no drainage. Pedestrian infrastructure like sidewalks or crosswalks are few and far between – if present at all – and cycling infrastructure is especially uncommon. To get around, most residents of these communities must take long walks to reach various forms of informal public transport that provide low-cost mobility. The isolation of these informal settlements significantly inhibits the socioeconomic mobility of their inhabitants. How, then, can cities expand access to jobs, education, and opportunities for these marginalized groups? One solution comes from the experience of Medellín, Colombia, which introduced the first mass transit aerial cable car system in 2004. By integrating the design of the system with other forms of mass transit and improving access for pedestrians, the city’s Metrocable system has helped connect low-income residents to their city and put urban mobility at the heart of equity. Aerial cable cars have been in use for over a century, dating back to 1914 in Bern, Switzerland. The cable car systems of the past were typically low capacity and designed to transport tourists, particularly in ski towns. When Medellín became the first city to implement aerial cable cars as a public transport system, it did so with equitable urban mobility and the city’s unique geography in mind. Cable cars, the city realized, would be well suited to serving the dense informal settlements on the city’s mountainous periphery. The first phase of construction of the Metrocable cost US$24 million, and resulted in a two-kilometer (1.2 mile) line that can transport 3,000 passengers per hour in either direction. This route connects residents on the periphery to Medellín’s metro system – with no additional transfer charge – in turn connecting them to the city’s employment hubs. The city coupled the implementation of the Metrocable with broader urban development projects, supporting its investment in public transport with efforts to enhance public spaces, expand pedestrian infrastructure, improve social housing, and build new urban amenities. This same campaign resulted in the Parque Biblioteca España, now one of the city’s most recognized pieces of architecture. As with the Metrocable, these projects involved extensive community participation and consultation, which helped city leaders direct investment to the areas most important to citizens. The success of the first Metrocable line prompted the city to build two more lines, which opened in 2008 and 2010. It also inspired many other Latin American cities with similar topography and socioeconomic dynamics to explore aerial cable cars as mobility solutions. La Paz-El Alto, Bolivia; Caracas, Venezuela; Rio de Janeiro, Brazil; and Manizales, Colombia have all built cable car systems that help connect peripheral communities to the urban core, with Cali and Bogotá, Colombia set to begin construction on their own. The trend is even spreading beyond Latin America. London, United Kingdom opened the Emirates Air Line in 2012 as it prepared to host the Olympics, New York City is planning the East River Skyway, and Haifa, Israel is preparing to build a four-kilometer (2.5 miles) network of cable cars to complement its existing public transport system. Cable cars fill a unique role in urban transport. They provide a high quality transport experience, contribute little to air pollution or climate change, and are particularly well suited to challenging terrain. They don’t serve quite as many passengers as mass transit systems like metro, for instance, but they typically require less time and money to implement. Perhaps the main advantage of aerial cable cars, however, is that they open the door for wider engagement with marginalized urban communities. 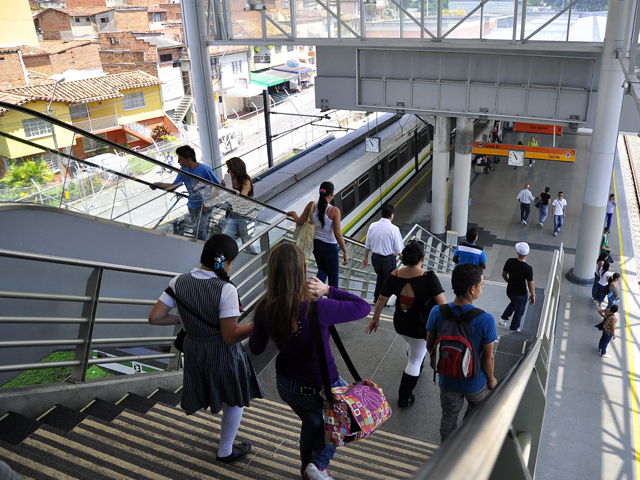 In the case of Medellín, the Metrocable has not only reduced overall transportation costs and increased access to employment for the city’s most disadvantaged groups, but also helped improve the built environment around them, enhanced public spaces, and strengthened social fabric through community participation. Together, these changes can shape more equitable, inclusive societies and improve quality of life for all residents. This article was originally published in Spanish by the Inter-American Development Bank’s Emerging and Sustainable Cities Initiative.